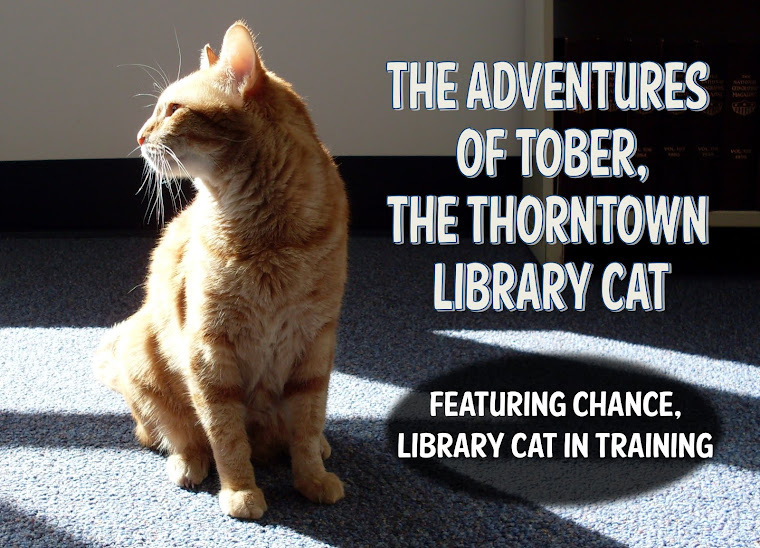 The Adventures of Tober, the Thorntown Library Cat: Happy (slightly early) Finding Day to Me! 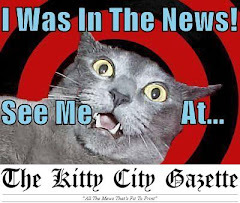 My Finding Day is big news here at the library. After all, how lucky are my employees to have a handsome orange Mancat for a Boss? Here is the article on the front page of the Friends of Thorntown Public Library, Inc. newsletter, which has a circulation of 330. Actually, they goofed the "Boss" thing earlier this week. More about that later. That right there is a Kitty Litter Cake! I thought everyone would be super-excited to dig in to my special cake, but for some reason everyone thought it looked yucky. 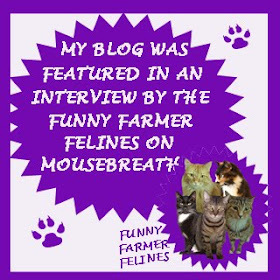 Trust me, it is nothing like my litter box, which is scooped faithfully and enthusiastically each and every day! The Kitty Litter Cake was deemed okay, and everyone got to try and lump or two of it. One lady was disappointed because she didn't get a special "deposit" in her portion! Hee hee! Here was my special Tober's Finding Day display at lunch. You will notice that there is only one present on that table. It's from AAB Becki, who also slaved away over my Kitty Litter Cake. I really don't know what the other 11 staff people are here for. Seriously. 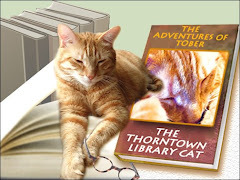 The OcTOBER reading challenge is called Be a PAW-some Reader in honor of my Finding Month. Children get to read books with the added bonus of submitting entries to win cool prizes. Myrtle made a great display on the bulletin board. I've had so many tummy rubs and hugs and pettings and treats today! I even let complete strangers pet me! (They were nice.) AB Christine only interrupted my nap one time--usually she's a pest. My Finding Day wish is for Everycat to find a fantastic Forever Home where they are loved and admired and fussed over. Just not at my Library. This is a one cat only facility! Oh---and just let me tell you about the Great Boss's Day Fiasco of 2013! Boss's Day was October 16--two days ago--Wednesday. I was very excited because it meant TWO me-centered celebrations in one week! Fantastic, right? Well, the staff here apparently got their wires crossed and thought that they should celebrate AB Christine's being "Boss" for some reason. So they decorated her office with balloons (black, the color of sadness and misery) and made her a card. Of course, she wasn't even HERE that day. She was off doing stupid stuff like laundry and grocery shopping, and wasn't doing any Bossing at all! She came into work on Thursday and saw her office. Guys, it was kind of sad. She got all excited like she got a promotion or something. Maybe she got confused and thought she had been made Boss during her day off? I don't know. I felt bad and let her pet me a little extra yesterday. I mean, just look at me. My presence is so very Bossly--was there ever any doubt? If anyone wants to try Kitty Litter Cake, we have half a pan here at 124 N Market Street in Thorntown, Indiana. It's in the fridge in the kitchen, and we're open from 10-4 tomorrow! Happy finding day, Tober! I'm glad your day got a decent amount of acknowledgment, even if they did get the Boss Day thing wrong. Happy Finding Day from me too, Tober. I am amazed at how many things WRONG your staff does. Haven't they had any training at all? I also think the Kitty Litter Kake looks very yucky and I am not surprised so much is left. Give me a banana split any day! Cheers, Tober, and keep up the good work, you ought to get a staff training program going! Happy 5th Finding Day, Tober! No matter what they think, you are the #1 Boss at your library! Happy Finding Day! I say you celebrate for five days to celebrate your five years of being there! If I lived near you, I'd be there in a minute. How exciting to have a party just for you. Boss Day, aren't you the boss ? Happy Finding Day, Tober!!! Mommy would like a piece with a "deposit', too!! I hope you had a great Finding Day!! Shouldn't it be Finding Month????? Triple treats every day for Tober??? Well, actually, triple treats for life sounds really yummy! Happy finding day and Happy bosses Day (belated) Tober! You have to let the humans have their illusions.....poor things shatter without them.